While exploring liqueurs at a smaller store in Dallas, I happened upon this bottle of Blue Mountain Coffee Liqueur that I can find little information about. Apparently, this was distilled at the World’s End Distillery in the Blue Mountains of Jamaica using a recipe developed by the owner, Dr. Ian Sangster. There is also a 34 proof cream liqueur version, but this is a 60 proof coffee liqueur. Based on my brief tasting, this is distinctly Jamaican in flavor as their style of rum comes through immediately. The coffee flavor is not as dark as Starbucks Coffee Liqueur and more of a “bright” flavor akin to Kahlua; however, the coffee flavor is much richer than Kahlua and this liqueur has a distinct alcohol burn that belies the proof statement. The gold seal on the lower left side is hard to read, but above and below it reads, “Bristol 1978” and “London 1976.” My thinking is that this bottle is from the late 1970’s or early 1980’s and I feel fortunate to have found it. This entry was posted in Liqueur and tagged Jamaican Rum, World's End. Bookmark the permalink. I don’t recognize the blue bottle, but I have been looking for that rum for about 15 years since I last was able to buy it in the states. This is the best coffee liqueur i’ve tasted and i wish i could get more. This week I found a matching bottle of the Blue Mountain Coffee Cream Liqueur and I hear its fantastic too. I’ll find out soon. I’ve since found more in glass bottles for really cheap. I found it last year at a small store in downtown Dallas, which closed at the end of the year. As far as I can tell, it’s not imported to the US any longer. You may have to get it from Jamaica if the distillery is still in operation and still producing this product. Hi Mark – thank you for your reply. I was able to fine one a year ago in a small shop in Ft. Lauderdale and they shipped it to me. Oh well – will keep looking. Thanks again! My husband and I bought a bottle in August while on our honeymoon. The liquor is still produced, but as far as I know U.S. folks can only buy it there, which is a shame since I wish we could have brought more back with us. I have a bottle of the Blue Mountain. I have no idea how old or where obtained. Still unopened. Got it from a friend that moved and he gave me his liqueur cabinet stock. He is from that area of South America. The price tag on the cap is $160.00. Go figures. Probably not us dollars. 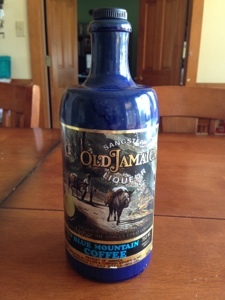 I have a full bottle of Sangsters Blue mountain coffee liqueur in a flagon…. I have no idea of its value…. it had been sitting in an old pub for 30 or 40 years, still sealed, well looked after. We lived in Kingston, Jamaica 35 years ago and Sangster’s was first coming into production around that time. Several kinds of liqueur, but Ian Sangster’s best, in my opinion, was the Blue Mountain Coffee liqueur and the Wild Orange and Ortanique. It was produced under the name of Old Jamaica Liqueurs then. I think that since then Wray & Nephew (a big food processor group in Kingston) have since bought it out. The last bottle I saw was several years ago under their label. My guess is that Ian’s son didn’t want to keep the company going on his own. I miss this stuff. The richness of the coffee flavor in amazing. The orange flavors were quite good. The run crème I could have lived without. I’d love to know if anyone has yet started to import this to the US and, if not, why.